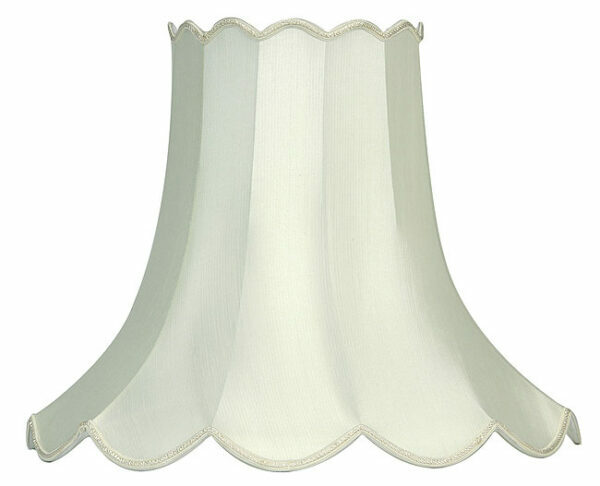 The traditional 12 inch scalloped fabric lamp shade in ivory fitted with a reversible gimbal to allow fitting as a pendant light shade. A 30cm lined lamp shade fitted with a 45mm shade ring to fit E27 lamp holders and 29mm adapter to fit B22 and E14 lamp holders. A traditional styled lamp shade in ivory with fleck patterned fabric. The shade is finished with a contrasting ivory trim and scalloped edge. A 12″ lamp shade for any table lamp or as a pendant lamp shade.